Keep cool and comfortable as the temperature rises with Techniblock - a transparent sunscreen that's invisible on the skin and offers maximum protection. Forget sticky creams and lotions and opt for Techniblock Aerosol Sunscreen, a clear non-greasy, oil and fragrance-free sun protection that won't let you down no matter how hot it gets. Offering high quality, broad spectrum and water resistant protection to prevent sunburn, Techniblock has an equivalent Boots 5* Rating and blocks up to 99% of harmful UV rays. An ideal solution for sensitive skin that's prone to prickly heat rash, the absence of oils and emulsifiers in the formula provides the wearer with a breathable, instantly absorbed and long lasting barrier against sunburn. 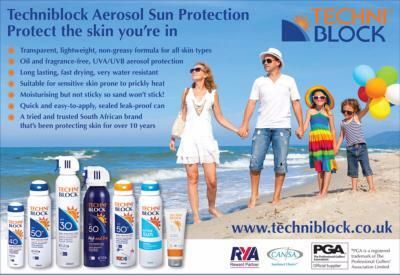 Techniblock's medium and high protection range includes SPF 30 and SPF 40 and an SPF 50+ for fair skins and redheads prone to burning, as well as a Children's Sunscreen. Whether you're holidaying at home or abroad, one quick application of Techniblock sunscreen will keep you and your family safe in the sun. No red patches, no heat rash, no stickiness, just lasting, light, all-day protection. "As a family of water addicts we are no strangers to world travel and hot climates. We have used sun screens in California, Brazil, Sri-Lanka, Hong Kong and in many other locations. My whole family agree that Techniblock products are the best we have ever used. One of our 8 year old twin girls has a sun allergy and has had to previously use steroid creams after being in the sun. However, ever since we started using Techniblock SPF50 Wet & Dry she has never had the problem. As a family we are pleased to endorse the Techniblock range". Techniblock is delivered in a sealed, leak-proof can and the continuous spray works at every angle to ensure even coverage, even for those hard-to-reach areas. Check out our independent reviews on Trusted Shops and Shopping Satisfaction and discover the best sunscreen on the market.